By Sharla Cerra, with information provided by Billings descendant Holly Brinkman and other sources. In July 2016, descendant and genealogist Holly Brinkman provided some information about the Billings family. James was born in Missouri in 1853. Tilman (or Tiglman) was born in Nebraska in 1857. Nancy Josephine was born in Table Rock on May 18, 1859. In March of 1861, Nancy died. She was only 33. She left her husband and her three children, then ages 2, 4, and 8. Later that year, Hiram left Table Rock and enlisted in the army in Ohio. Why he went to Ohio to enlist is unknown, but in December 1861 he did. He enlisted in Company B of the 67th Ohio Infantry. He was 43 years old. This regiment was organized in the state at large, from Oct., 1861, to Jan., 1862, to serve for three years, and left Columbus [Ohio] for the field, Jan. 19, 1862, going into western Virginia. It was the first to engage the enemy at Winchester on March 23, and lost in that action 15 killed and 32 wounded. At Harrison's landing it campaigned with the Army of the Potomac till the evacuation of the Peninsula, when it went to Suffolk, Va., with only 300 men for duty out of the 850 which composed the regiment at the organization. Being then transferred to the Carolinas, for seven months it heroically endured all the hardships, privations, and dangers of the siege of Charleston, taking part in the attack on Fort Wagner and sustaining a heavy loss. More heavy losses were sustained at the battle of Chester Station. Ten days after that, they participated in a charge at Bermuda Hundred in which they again suffered heavy losses. On Aug. 16, four companies charged the rifle-pits of the enemy at Deep Bottom and at the first volley lost a third of their men ; but before the Confederates could reload the rifle-pits were in possession of the Buckeye boys. ​During the spring, summer and fall of 1864 the regiment confronted the enemy at all times within range of their guns ; and it is said, by officers competent to judge, that in that time it was under fire 200 times. Out of over 600 muskets taken to the front in the spring three-fifths were laid aside during the year on account of casualties. It was in the siege of Petersburg, witnessed the close at Appomattox, and was mustered out Dec. 7, 1865. Another regimental history follows the regiment's movements throughout the war. It can be found at http://www.civilwararchive.com/Unreghst/unohinf5.htm#67th. 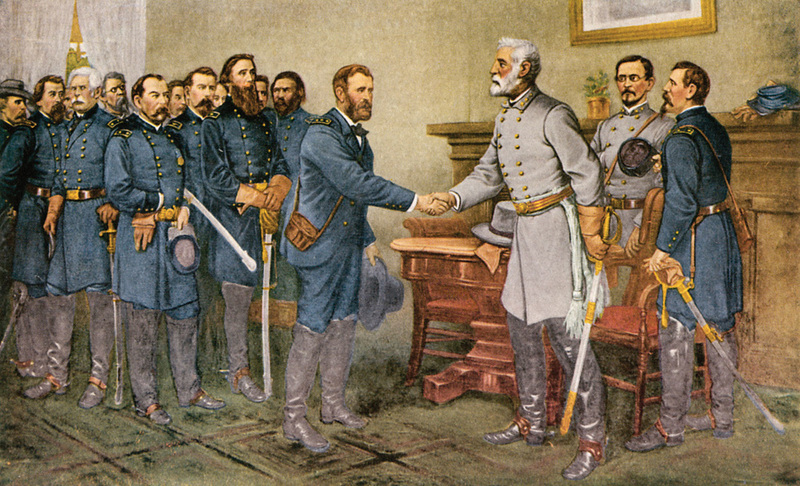 After months of guard duty, Hiram was released to return to Table Rock in the Fall of 1865. The Dimons were among the very earliest settlers in Table Rock. The Dimons arrived in Table Rock with others who made the journey from Pennsylvania in the Spring of 1857. 'At Weston, Mo., they were obliged to disembark from the boat, as the river was full of ice, and was not navigable beyond that point. Mr. Dimon bought a yoke of cattle, and from that city they traveled in a wagon up through Kansas, and arrived at Table Rock on April 4, 1857.' The Dimons pre-empted 160 acres of prairie land three miles southeast of Table Rock, on the east side of the Nemaha River.
. . . [They] lived “comfortably” in a log house, fourteen feet square, during their first ten years in Nebraska. Hiram Billings' first wife, Nancy, died in Table Rock in 1861. Her tombstone is one of the oldest in the cemetery. Charles & Carolina Dimon o the occasion of their 50th wedding anniversary. Photo 684 of the Table Rock Historical Society. 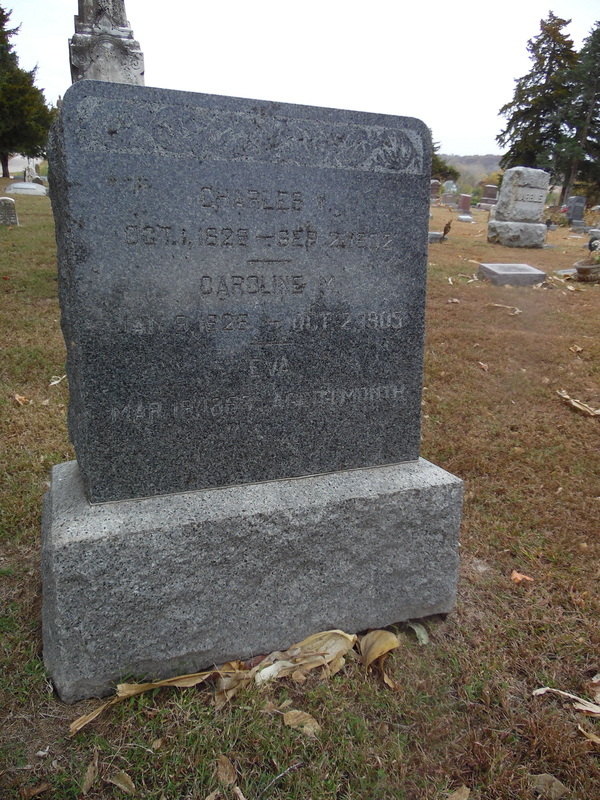 Tombstone of Charles & Carolina Dimon in the Table Rock Cemetery. Charles, 1826-1902, Caroline, Caroline 1826-1905. According to family legend, Nancy Josephine was taken by the indians for a period of time. Do you know anything about that sort of thing? According to a story preserved in Chapman Brothers’ Biographical Album, a band of Indians dropped in on Caroline Dimon when her husband was away. Seating themselves around the fire [they] made themselves quite at home, much to Mrs. Dimon’s alarm. When the fire needed replenishing she did not dare to go for firewood, fearing that her unwelcome guests would steal something while she was away. But when the temperature of the room became too cold for Messrs, lo they found their way to the woodpile, and returned to the house laden with fuel, and rebuilt the fire themselves, and prolonged their visits for some time. Since little Nancy Billings is not mentioned, she may not have come to live with the Dimons yet, but in any event this is the environment in which she was raised. Her father was still away at war. Read abut the horse thieves! ​So, she lived in Table Rock through a good deal of her 20's and married my great-great-grandfather, Martin Higinbotham on March 21, 1878 in Pawnee County. They had five kids: Bert Elmer (1880-?? ), Gracie (1882-?? ), Blanche (1889-?? ), Roy Lewis (1891-1971), and Nellie (1898-1970). I know from the census research that I've done that she and her husband Martin lived next door to Hiram in 1885. I'm not sure why that blew my mind...but it did.! 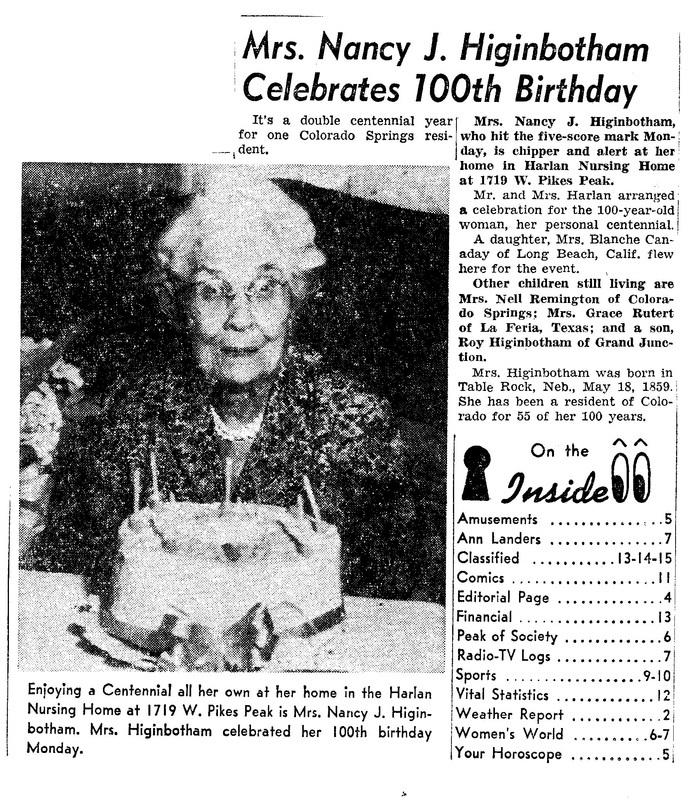 Anyway, Nancy Josephine lived to be 101 and according to my mom and my great uncle who knew her, she was a real spirited character! Holly brought Nancy Josephine to life. 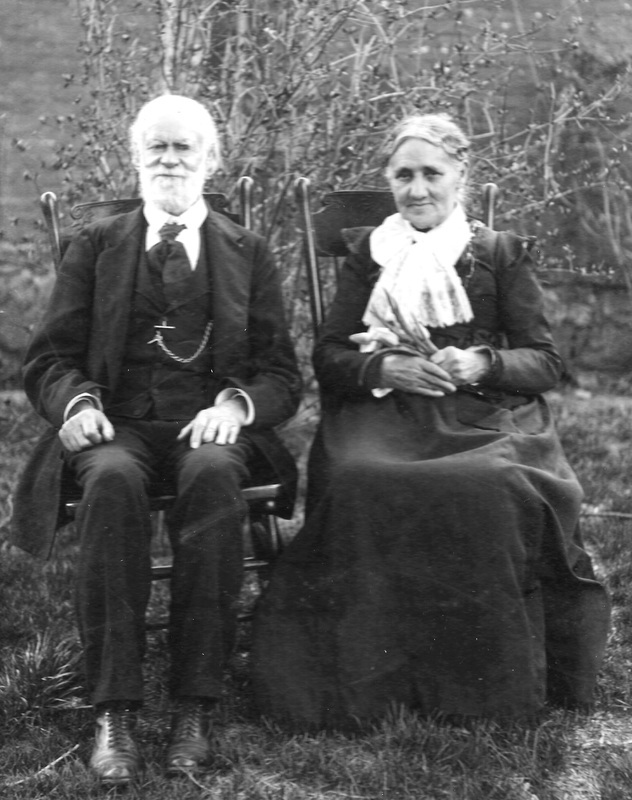 As with so many of the pioneers, only photos of them in their old age exist. But you must look into those eyes and think where they have been and what they have done! Everyone I've ever talked to about her said that Martin adored her and that she was a really beautiful woman. I feel like it was probably difficult to lose him. Martin, who was born in 1854, died in 1931. Nancy, who was born in 1859, as 72 at the time, and lived 29 years without him. Here is a photograph of Holly Brinkman's mother, Marilyn Higinbotham. With her are three of her four great grandmothers, who include Nancy Josephine, who is on the far right: Holly note that all of these great grandmothers lived to be at least 100 years old! 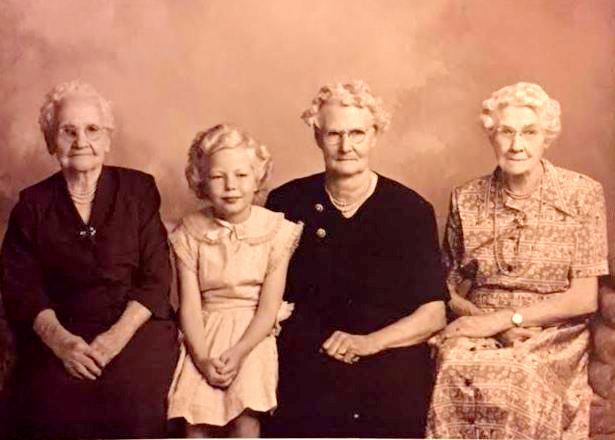 Anna Baker, Marilyn Higinbotham (the little girl), Elvessie Harrington and Nancy Josephine Higinbotham. hiram marries rosetta mcneal after the war. After the war, Hiram married Rosetta McNeal. She was the little sister of of Civil War veteran William McNeal, the only Table Rock boy known to have died in the war. William's remains were not recovered, and a military stone has been secured but has not yet been placed. Hiram and Rosetta moved to Lewiston, Nebraska at one point as their daughter was born there. They had at least four children together, a daughter, Mary Ann, and sons Thomas, Will, and Charles. 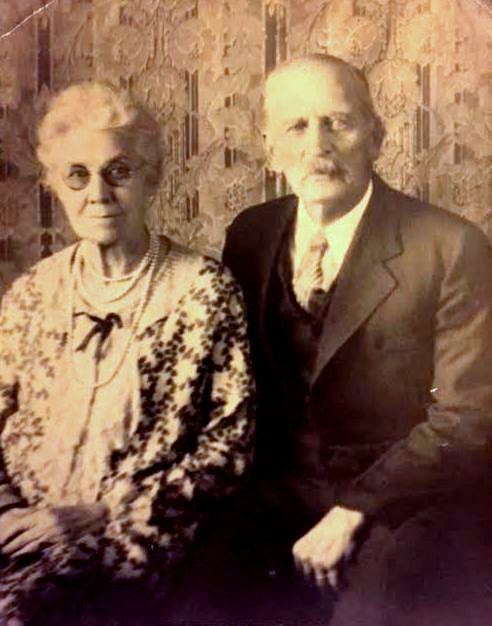 Mary Ann married Charles Brock in 1885; they are buried in Table Rock, as are their children Baid Dee Brock (1888-1950)(who married Cora Tenk) and Verta Brock Wasmund (1894-1934). Hiram died in 1904, and Rosetta in 1906. They, too are buried in Table Rock. 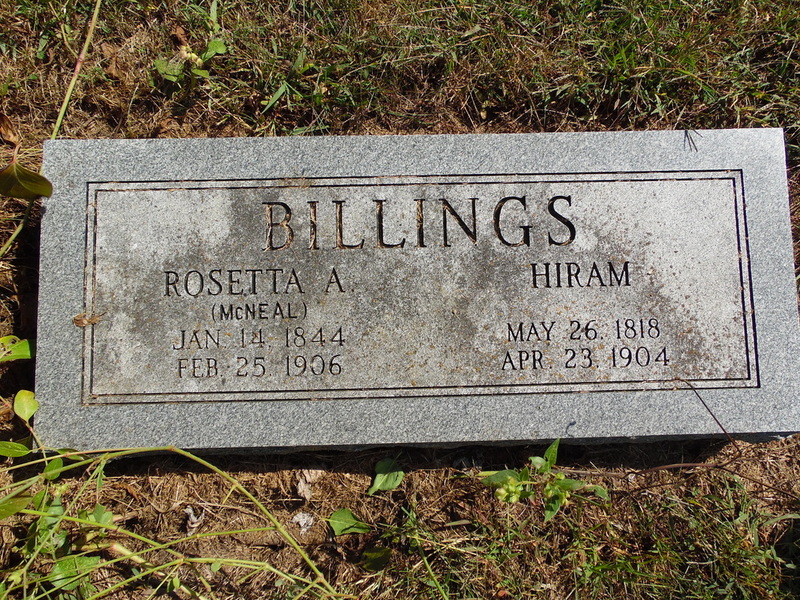 Hiram and his second wife, Rosetta McNeal Billings are lie near Nancy. He died ij 1904, she in 1906. 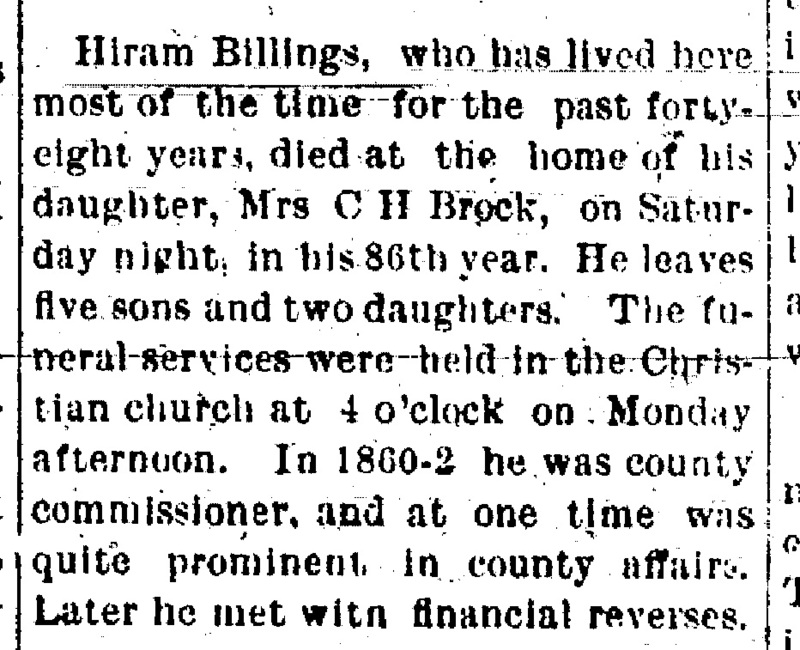 For some reason, the Argus was not doing regular obituaries at the time that Hiram died. His is very brief; others are of similar brevity. His simply says this. Note that the recollection of his being county commissioner in 1862 is inconsistent with his Civil War service. However, the article was obviously provided by family members who were not old enough to have known such a detail.